The World Health Organization reports that between 2 and 3 million non-melanoma skin cancers, and 130,000 malignant melanomas are diagnosed every year around the world. These cancers are most commonly linked with exposure to the sun. There are three types of ultraviolet rays: UVA, UVB, and UVC. While UVC rays rarely make it through the earth’s atmosphere, UVA rays can cause wrinkles and fine lines. UVB rays are linked to sunburn and cancers. Fortunately, a broad spectrum SPF sunscreen can prevent damage from the sun’s rays. Some people believe that the higher the SPF rating, the better a sunscreen is. This is not necessarily true. 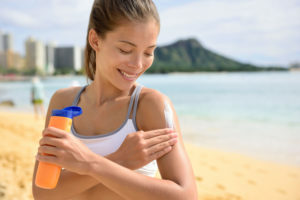 While the Skin Cancer Foundation recommends an SPF of at least 15, it’s not necessary to go much higher than 30 to get the necessary protection. Sunscreen rated at 30 SPF blocks approximately 97% of the sun’s rays. More important than the number on the bottle is how you wear and apply sunscreen. When bathing or exposed to water, it should be reapplied often. If you have fair or sensitive skin, opt for a higher number. Finally, look for a bottle that boasts of “broad spectrum” coverage. These types of sunscreens block both UVA and UVB rays, offering the best protection. Ideally, children under six months of age should be exposed to direct sun as little as possible. Keep infants in the shade, and use blankets, or a wide-brimmed hat to keep their skin protected. Infants and toddlers over six months of age should have sunscreen with a rating of 30 SPF or higher applied to exposed skin. Sunscreen should be re-applied every two hours or immediately after swimming or bathing. If your infant or child has sensitive skin, look for zinc oxide or titanium dioxide, or something made especially for children, to avoid irritating their sensitive skin.